How to Delete Your Gmail Account? Gmail.com is a free email service brought about by google and is supported by advertising. If you have a Gmail account, you already know that it can help you send and receive emails and messages and also able to store them. If you do not have an account, follow the instructions: How to create an Gmail account? Aside from that, it gives you the power to search the email or message that you want to read from the past and you do not have to search it page by page. You can do a lot of free service in Gmail that will enjoy and it can really help you in a lot of ways. A lot of us have created our own Gmail account and we can even create multiple accounts. But, if you have decided that you don’t need your Gmail account anymore, or for whatever reason, you can just delete it as you want but you have to go through different steps. But, before you finally decide that you will delete your account think carefully and make sure that you don’t need it anymore because most of the time, you cannot restore it anymore. Always remember that you should back up your important emails because they will be permanently deleted along with your Gmail account. First is to sign in to your Gmail account. Once you have signed in, navigate to the upper right corner, look for your email address and then click account on the pop up menu that appears. Once you have opened the account page, you will see information related to your google account as a whole rather than mail settings alone. What you should do is to navigate on the left side and click on products. Once you have entered the products page, you will see a list of google products that are linked with your account. What you need to do id to click the word edit beside Your Products. The next page will present you a number of options to choose from. The options may differ but the two main options will be to delete your entire google account or just your Gmail account permanently. 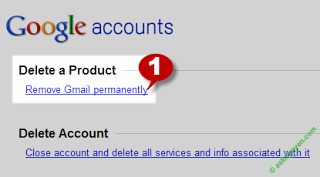 If you gave many email addresses on google, make sure that you will delete the email address you no longer want. If you only want to delete a specific Gmail address, then click, Remove Gmail Permanently. The next page will be some information about deleting your Gmail account and you should read it carefully. After reading it and you have fully decided to delete your Gmail account, then go ahead and click the small box below and provide a new primary Gmail address to associate with your google account, provide your current password and click Remove Gmail, and you’re done! These are all the steps that you should follow if you are going to delete your Gmail account permanently. Read carefully each step and follow the steps correctly so that you will be able to delete your Gmail account successfully in no time. Gmail login, Gmail.com log in, Problems when signing in Gmail? Gmail sign up, How to create Gmail account? Copyright © 2019 Login tutorials. All Rights Reserved.